From Goodreads ~ For 15 years, Tom Stephen had the unique distinction of being both drummer and manager of the Jeff Healey Band. The dual role was fraught with conflicts of interest. One minute, he was leading the debauched life of a rock musician; the next, he was disciplining the band for the havoc they caused. But few knew or understood Jeff Healey - a national icon and one of the world’s best blues guitarists - better. Funny and loyal, with a luminous mind and staggering talent, Healey was also provincial, stubborn, obnoxious and antagonistic. This book explores both sides with honesty, clarity and humor and reveals what life for the band was really like: Jeff challenging ZZ Top to a bowling competition - and winning; Bill Clinton inviting the band to the White House, and enjoying a special audience with Queen Elizabeth II. To say nothing of the legendary guitarist’s interactions with Bob Dylan, George Harrison, Keith Richards, and more ... Tom Stephen was there for it all. He believes that young fans deserve to experience Healey’s brilliance - to understand the complicated man behind those timeless sounds. Best Seat in the House offers an authentic perspective that fans won’t find elsewhere. I was a fan of the Jeff Healey Band and saw them many times in the late 1980s/early 1990s in local bars like Grossman's and Albert's Hall. So I thought it would be interesting to read this book. Jeff Healey (1966 - 2008) was a Canadian blues-rock and jazz musician, born and raised in Toronto. When he was a year old, he lost his sight to cancer. His eyes had to be surgically removed and he wore prostheses. He started playing guitar when he was quite young and developed a unique style (playing with the guitar on his lap). With bassist Joe Rockman and drummer Tom Stephen (the author of this book), he formed The Jeff Healey Band in the mid to late 1980s. They released their first album in 1988, which produced some hits and won awards. Around this time, they were the "house band" in the Patrick Swayze movie, Road House, plus they recorded the soundtrack. They released more albums over the years to some success. But Healey's interest in blues and rock 'n roll and touring began to wane and the band eventually broke up. Healey opened a bar at Queen Street W/Bathurst with live music (I'd been to it lots of times) and starting moving more into jazz. He passed away in 2008 from cancer. 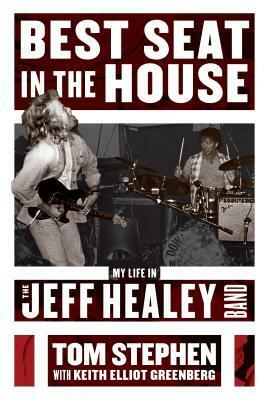 This book is Stephen's experience being not only the drummer in the Jeff Healey Band but also the band's manager (which did cause friction at times). It tells the stories of the band living the crazy rock 'n roll lifestyle ... booze, drugs and women ... what happened after the band broke up. I liked this book. I found it interesting to get the behind the scenes stories of the band's experiences on the road, the pressures and temperaments, why they made the decisions they did, plus meeting famous people like the Rolling Stones, former President Clinton and even the Queen. Before the band broke up, there was tension between Healey and Stephen and after the band broke up, they pretty well stopped speaking (though Stephen says he doesn't know why Healey shut him out). There is bitterness between Stephen and Rockman and Stephen and Healey's widow. Whenever I read /biographies and autobiographies, I usually take them with a grain of salt because it's coming from one person's perspective.